The Lost Vanguard: Soviet Modernist Architecture 1922-32, an exhibition of photographs by Richard Pare currently displayed at the Graham Foundation, is a compelling portrayal of an architectural community that sought to take an active role during a time of great change. This collection documents the sizable contribution of new buildings by a relatively small group of visionary, if not guileless architects, following the Russian Revolution and subsequent civil wars. The buildings showcased in the exhibition are located throughout the former Soviet Union, drawn from over 15,000 photographs taken by British photographer Richard Pare during his trips from 1992 onwards to Azerbaijan, Ukraine, Georgia, and Russia. The exhibition is marked by a mood of somber immediacy. This is a testament both to its unfinished nature and to its need for perpetuation and remembrance. By highlighting a small group of revolutionary architects and their work, Pare does a great service to those artists who today also work towards revolutionary ends, if in the hope for a different sort of outcome than what’s exhibited here. 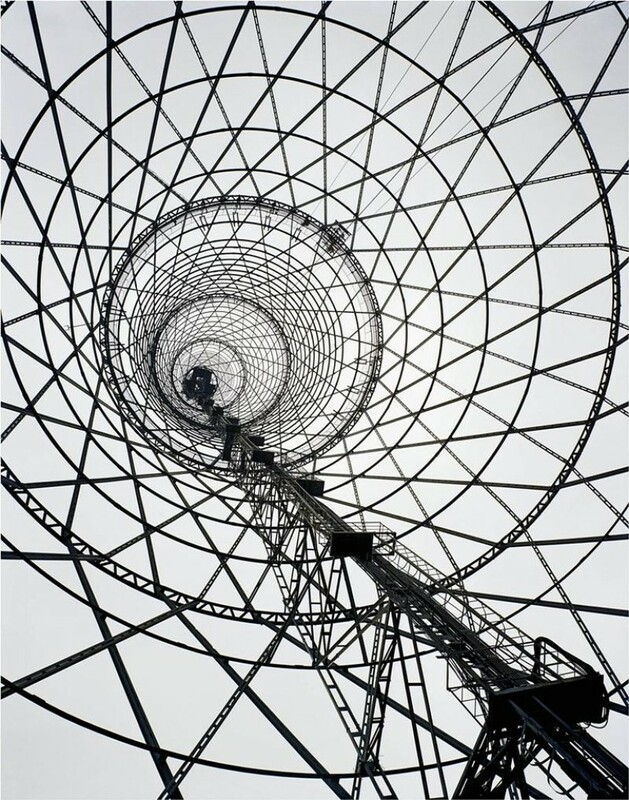 A photo of the Shabolovka Radio Tower in Moscow, which was designed by Vladimir Shukhov, is displayed on the posters advertising the exhibit, and is a stunning example of the ambition and spectacle that marked this era of Soviet architecture. The building, a display of the desire for a cutting edge social movement, is fittingly located near the Moscow Kremlin. Hyperboloid in structure, its pyramidal, mesh design suggests the architect’s desire to perpetuate the sense of daring and excitement that characterized the time during which it was built. One particularly exciting piece is a photo showcasing the Gosplan Garage on Aviamotornaya Street. Although completed in 1936—just ahead of the exhibition’s time range—this building exemplifies the excitement one feels about the stylized visualization of many other structures documented in the gallery. Modeled after a car’s grille, the garage is indicative of the great faith that contemporary architects had in innovative technology and its ability to improve aspects of Russian society. Having never wanted to label himself a Constructivist architect; however, Konstantin Melnikov’s commitment to broader forward movement and artistic advancement is shown entirely in his work, primarily through his refusal to conform to Stalinist structural design common during the 1930s. He would later move away from architecture as a whole and spend the rest of his days as an oil painter. Moisei Ginzburg and Ignaty Milinis’s Narkomfin Communal House, completed in 1932, shows a different side of modernism that came after the revolution. The interlocking design of the apartments were said to encourage a socialist lifestyle by creating communal areas that would encourage the liberation of women and other disenfranchised groups from their traditional roles. To the viewer, at least, this intent is juxtaposed with a vision of one of the flats’s rooms, cluttered as it is with cheap goods on a table that is overshadowed by a poorly reproduced Sistine Chapel. Other notable highlights include a DneproGES turbine room in Zaporozhe, Ukraine, and the Workers Club in Surakhany, Baku, Azerbaijan, as well as the Red Banner Textile Factory in St. Petersburg, Russia. While walking through the exhibit one feels the buildings’s sense of abandonment. For while this exhibit has garnered great interest and praise, others, far away from this exhibition, are far less concerned with these stunning, beautiful, and sometimes puzzling structures. It is understood that this exhibit is meant not simply to showcase structures, but also to convince the spectator of their beauty and value. In asserting their value, it seems that Pare takes a more active role in his photographs. His goal is not simply to document a history but to present the conflict between the crushed revolutionary spirit of post-1917 Soviet Union and the now wavering idealism of Russia following the destruction of the Berlin Wall. For although the Kremlin has long since ceased to be a metonym for Soviet reign and jaded reactionist oppression, only now is the government offering funds for restoration of the decrepit Shabolovka Radio Tower, standing just a few kilometers away. The Lost Vanguard: Soviet Modernist Architecture 1922-32 exhibit runs at the Graham Foundation through February 16, 2013.